We did a lot of hiking over the couple of days that we were there. One thing I was amazed at was the amount of people that visit the Grand Canyon. We are usually not a fan of large crowds of tourists, we like to enjoy nature/scenery on our own. The majority of tourists were at the central look out points near the visitor centre. 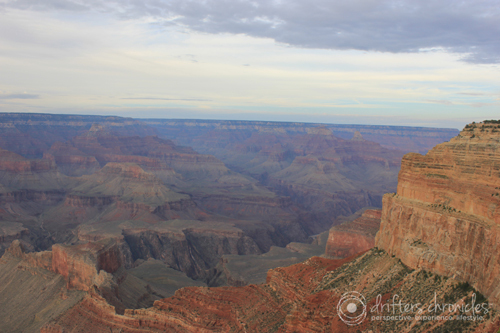 If I was to visit the Grand Canyon again, I would most likely go to the less crowded North Rim. We spent our first day at the Grand Canyon hiking on the west side of the park, which is also the most popular. The weather was amazing and I was surprised that it wasn’t scorching hot after feeling the heat of Vegas. I forgot that we were elevated which made it cooler, especially in the evening. We read stories about people hiking down to the Colorado River getting sick because the temperature goes up significantly over 100 degrees/38 Celsius. Some of the best photo opportunities came as the sun was starting to go down. 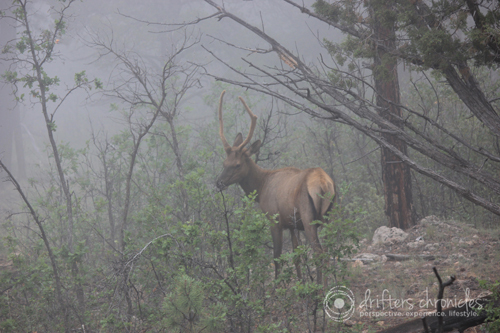 One of the things I was most amazed about was the amount of wildlife we saw. Totally an unexpected bonus. 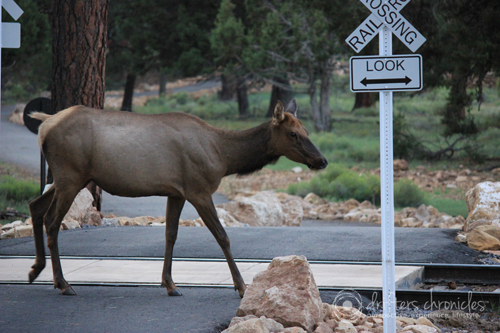 We saw Elk all over the place and a family of Mule Deer. We were lucky to capture a few photos (below). There were some portions of the trail that were cliff side with no fences or barriers but the trail was wide enough that we didn’t feel nervous about it. We made a video to illustrate that below. We hiked the Rim Trail which was pretty leisurely. The second day we hiked along the east part of the park and visited the Desert View tower. 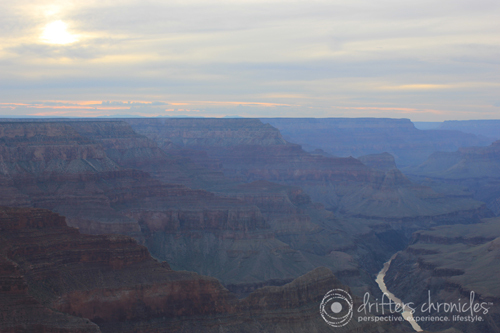 It was so foggy that day that we couldn’t see the Grand Canyon, it was like it disappeared. Regardless, there is a reason why this is one of the most visited natural sites in the world. Add it to your list!!! 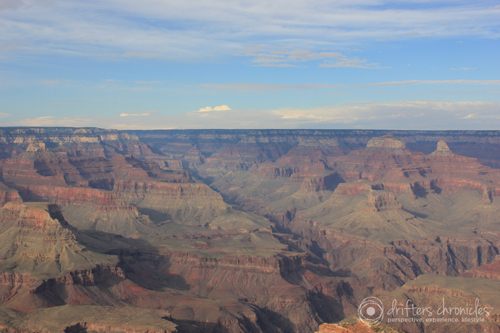 This entry was posted in Arizona, Experience, His, Lifestyle, Nature, North America, Perspective, Photography, Uncategorized, USA, Wildlife and tagged Arizona, Grand Canyon, Hiking, Nature, Rim Trail, Travel, Wildlife. Bookmark the permalink.